SANTA ROSA, Calif., February 11, 2013 — Thermal Technology, a leading manufacturer of crystal growth equipment and high temperature furnace systems, recently shipped 14 K1 sapphire crystal growers to a customer in Europe for HB LED applications. The K1’s large 90kg sapphire boule is optimized for 4” and 6” cores used in LED production, with 8” cores possible. As Thermal Technology completes sapphire growth protocol transfer at its customers’ facilities, K1 sapphire production has increased noticeably with customers producing large, high quality boules and reporting yields of 4200mm TIE. Over recent decades, LED lighting technology has developed and commercialized to the point that LEDs are replacing incandescent light bulbs in common lighting applications. Refined LED technology has led to the development of high brightness LEDs (HB LED) used in electronic display backlighting and other high tech applications. Producing HB LED requires higher quality, single sapphire substrate. Thermal Technology’s Model K1 crystal grower is intended for HB LED substrate production. To satisfy the demand of the growing high quality sapphire market, Thermal Technology has successfully tripled their Santa Rosa, California manufacturing facility. 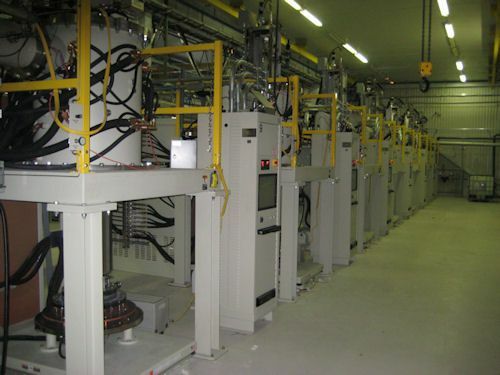 Thermal Technology is a global manufacturer of advance thermal processing systems, including crystal growth equipment, high temperature laboratory and production furnaces, hot presses and spark plasma as well as direct current sintering systems. Thermal Technology has 60 years of experience with more than 3000 installations in 40 countries. Thermal Technology K1 HB LED sapphire growers installed at a customer’s site.